Schwalbe Fat Frank Balloon, 26" x 2.35"
Micro USB Charging Port on Display, Hold Reset and Information Button to Enter Settings (Navigate with Information Button, Select with Lighting Button), KMC X10e Chain 1/2' x 3/32"
The 2016 Electra Townie Go! switched from using a SRAM hub motor and rear mounted battery pack to the Bosch Centerdrive which is better in pretty much every way. Now, it is more expensive than the 2014 and 2015 models at $2,727 and it does weigh more at ~58 lbs but you get an eight speed internally geared drivetrain and a lot more power that produces less noise when running! With a top speed of ~20 mph and an integrated rear rack the Townie Go! would make a decent commuter but it’s really best suited to relaxed neighborhood riding. 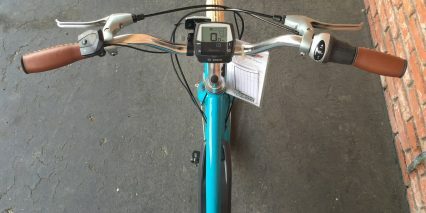 There are four levels of pedal assist to work with here and the lowest, Eco mode, will move the bike at a slower speed for people who want to take it easy. The oversized Schwalbe balloon tires function almost like a basic suspension in that they absorb cracks and bumps as you ride, they do weigh a bit more but the contact patch is enlarged and they feel pretty stable. At 26″ in diameter they don’t lift the frame as high as more traditional 700c (28″) wheels and tires but you still get reflective sidewall stripes and Kevlar lining for safety and durability. Driving this bike is a 350 watt Bosch Performance Cruise motor that measures bike speed, pedal speed and pedal torque (up to 1,000 per second) for instantaneous starts and stops. The motor spins your chainring that’s about half the size of most traditional rings and this higher RPM delivers a wider range of pedaling speeds in my experience. When you shift, the motor responds and eases off so as not to mash gears or put strain on the chain. Powering the motor and integrated Spanninga lights is a 36 volt 11 amp hour battery running on Samsung Lithium-ion cells. It’s the same Bosch PowerPack 400 I’ve seen for the past year and a half on other models here in the US and it works just as well. You can charge it on or off the frame and it locks securely but make sure you push hard when re-attaching it to the frame so that you hear a click and know that it’s fully connected. 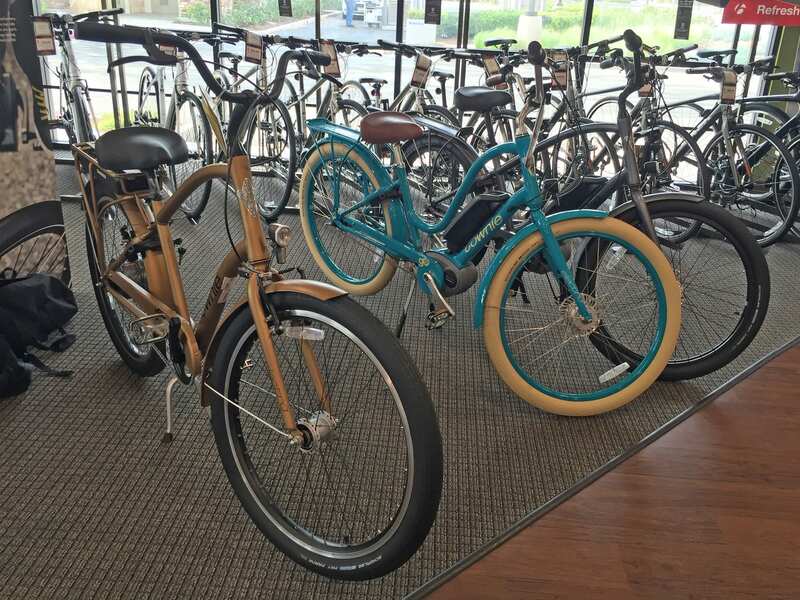 Just like the 2015 model this latest Townie Go! features a cafe lock that disables the rear wheel for quick stops around town – saving the hassle and discomfort of carrying a u-lock or chain. 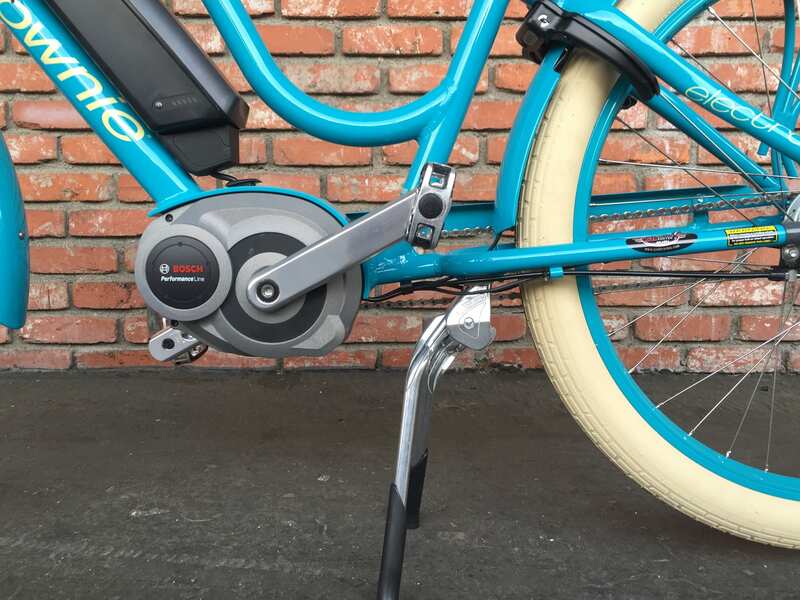 The biggest takeaway from this review should be that the Electra Townie Go! with Bosch drive system is more expensive but it’s way better and quite worth the price in my opinion. Range is more than doubled, the frame is stiffer and better balanced, you get more gears to pedal with and while there still isn’t any sort of suspension on the bike it rides very comfortably with balloon tires, padded grips, oversized saddle, swept back bars and the signature “Flat Foot” seating position that brings pedals forward vs. straight down. The two frames are very similar in weight, come in a wide range of colors and are warrantied for two years by Trek (which acquired Electra in 2014). 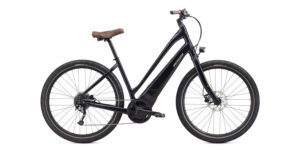 If you enjoy riding but are struggling to keep up with a friend, scale hills or fight the wind the electric Townie Go! will become your best friend, I am not exaggerating. The motor and battery are overkill but not in a bad way, they operate quietly but can climb almost anything, the display panel is large and easy to read with an intuitive button pad (easy to reach and use even without looking down). 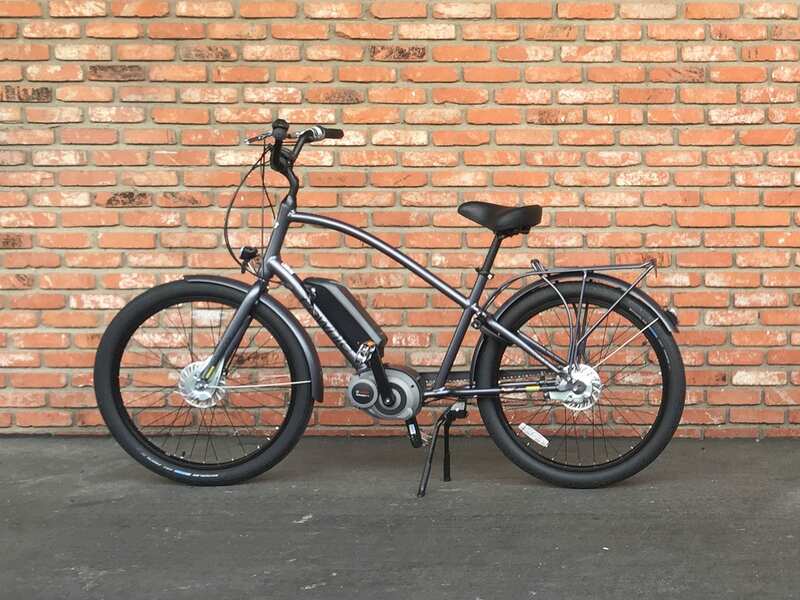 This is my favorite cruiser style electric bike to date. That is the most beautiful e-bike I’ve seen! But what I want to know is what helmet are you wearing in the video? Hey Klatuu, cool name :D I agree with you, the Townie Go! is one of the most beautiful bikes I’ve tested and the different colors are awesome… To answer your question though, I’m wearing a helmet from Specialized called the Echelon II size Medium 54-60 cm (here’s a product page for the standard Echelon, not sure of the differences but you can search Google for the Echelon II for sale). I like this helmet because it’s bright white with reflectors built on and has an adjustable plastic slider at the back (with a little plastic wheel you twist). I’m able to wear it with my glasses and have owned it for over five years at this point and it’s doing well. I visited Specialized HQ in Morgan Hill California last year and got to see some of their new equipment (including helmets) they explained that as the foam and plastic becomes brittle or if you hit your head moderately hard even once it’s good to get a replacement so I may be due, I’ve enjoyed it a lot though and hope this feedback helps you find one yourself! In the review this bike is referred to as a great neighborhood bike, but perhaps not the best for longer commutes. I was just wondering your opinion on why? If this were a non-electric bike, the weight and inefficiency of it would certainly disqualify it. However, as an electric bike I would think that these would not be an issue when looking for the perfect commuter. 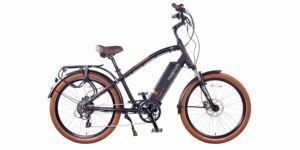 What are the criteria that would make up an excellent electric commuter bike? 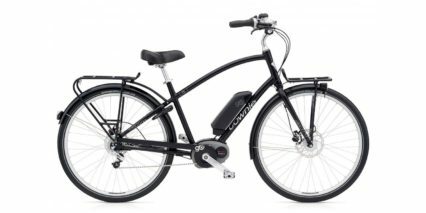 I’m looking to purchase a bike for my wife who commutes 10 miles each way (80% bike path). Hi I’m interested to buy that bike but I am just wondering if there is a maximum weigh for riding this bike ? Great question Odette, I am not completely sure but most ebikes I see out there limit weight at 250 or 300 lbs. 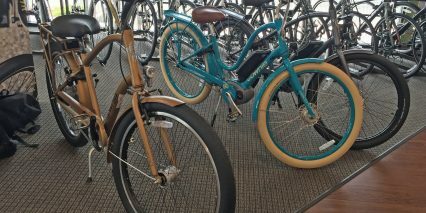 My guess is that the Electra Townie Go! 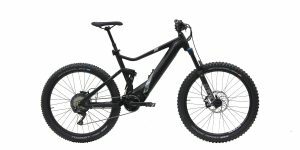 is similar but you could contact your local Trek dealer and ask them to be sure :) if you find out please comment here again to help others and I will add the information in the review! I’m looking at the Townie Go for cruising the neighborhood which includes some fairly steep hills. The Bosch system is 350 watts with a 36 v 11ah battery. I’ve been comparing it to the Bafang bbsd at 1000 w and 48 v 15-29 ah battery. Is it that more efficient? It seems underpowered for a guy like me who weighs over 200 lbs, yet in the review you stated it is overkill. Thanks for your reply! Thanks Court! Townie Go’s are very hard to find and there aren’t any dealers locally that have one in stock to test ride. My wife and I plan on riding together. Our rides will be casual and certainly nothing over 20 mph so we liked the idea of a Townie Go. It also fits our other requirements such as fenders, comfort, upright riding position and wide tires. One downside is the cost to replace the battery. At $800 or more it is about twice the cost of a battery for a Bafang kit. It would be great if someone would produce an aftermarket battery for the Bosch mid drive at a substantial savings. Thanks again Court. Your research is invaluable to those of us shopping for ebikes. Btw we are not going into this totally blind. We have test ridden Pedego Interceptors and I have test ridden a Pedego Ridge Rider to get a feel for the difference between pedal assist and torque assist. We also rented Pedego bikes that were throttle only. We went to a local Trek store that had non-motorized Townies and rode several of them. I’m reasonably certain that a Townie Go will work just fine for my wife who is petite and in great shape. I plan to buy her a Townie Go that she can enjoy and then see if it will handle my larger size especially up the hills in our area. If it does then I’ll buy a second one for me. If not, then I’ll be back with more questions. Thanks for helping. Can this bike successfully pull a standard large dog trailer? I have a 110 lb pitbull that had surgery on both knees. He misses our long walks so I figured I could tow him around instead. This prompted my research into electric bikes. I’m petite and nearly 50 so it would be impossible without the electronic assistance. Hi Denise! My opinion on this is yes, a strong yes :) I don’t want you to be disappointed and suppose there are many factors to consider here like the trailer you get, how heavy you are, the terrain, even wind but the Bosch mid-drive is very powerful in my experience. Here’s another review with a video of me climbing a very steep mountain with nearly the same motor from Bosch doing just fine. Thanks for the quick reply. I’m running into a problem with the attachment of the trailer to the back fork of the Townie Go! because of it’s single chain setup. But I really love the Townie Go!. Can you recommend a similar bike. I can then research that. Your reviews are the best I’ve ever seen regardless of the product. You have made this decision much easier for me. I just purchased 3 days ago from my favorite local bike dealer the azure colored Townie Go! 8i. They didn’t expect to get it in until December 2016 and one came in so I was the lucky one who got it. I want to thank you for the excellent review video you did on this electric-assist bike. Your video was so thorough in explaining everything regarding the Townie Go!. You helped me learn very quickly all the features and how to use them. I can’t thank you enough for taking the time to create this video. I hope it stays on this website so that I can refer back to it whenever needed. I like your very clear style of explaining things and providing your opinion on what you really like about the bike and what could be better. This is one of the best review videos I’ve seen. THANK YOU! Hi Court, thanks very much for your reply back to my comment. I forgot to add that, not only do I absolutely love riding my Townie Go and love how it looks, but I actually chose to buy this specific bike based on your review. I originally rode my very first electric bike in Kauai last October and enjoyed riding it so much that I knew my next bike would be electric. Last month, there was an electric bike Expo in our area and I had the opportunity to ride many different brands of electric bikes. I actually never saw the Townie Go while there (although my bike dealer said they had them at the Expo) but there were so many bikes to test ride I just never saw it. (On a side note, I did learn from the bike dealer that the bike I rode in Kauai was a true electric bike with a throttle and I didn’t have to pedal, whereas the bikes at the Expo were all electric-assist where you do have to pedal.) 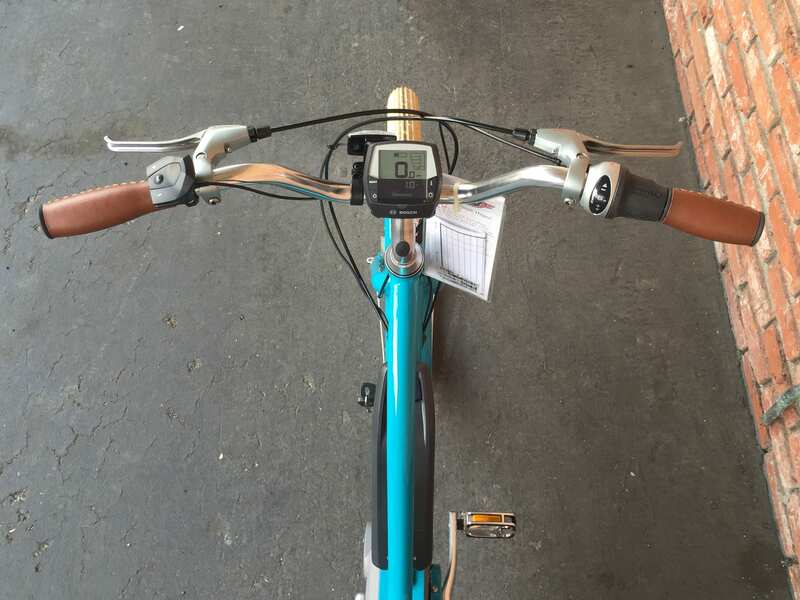 Anyway, I digress…of all the bikes I rode at the Expo I thought I liked the Trek the best so as I was doing some research online I came across your review of the Townie Go. I liked your review so much that I went to my bike dealer and asked to ride one. He didn’t have any of the step through bikes but he had the high step like the one you have in your video that I rode. The rest is history but I credit you and your video for my choice of the Townie Go. I was even willing to wait until December 2016 to get it but, as luck would have it, one azure step through came in to the dealer and since I was on the waiting list they called me first. A question I have for you is that I don’t like not being able to see traffic behind me while riding. Is there a mirror that will fit on the Townie Go that you would recommend? I prefer not to use the mirror that you can attach to your glasses. Again, I thank you for an awesome video. I have watched it 5 times now as I try to learn everything about my new bike. will the power pack 500 work on this bike…would it offer more range than the 400 that comes with the ebike? 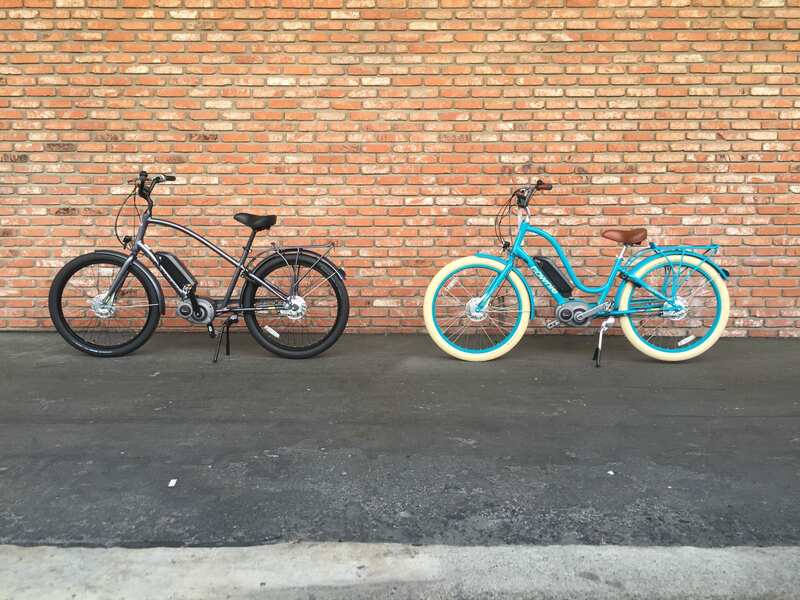 Hey Scott, great question… Yes, I believe the Electra Townie Go! 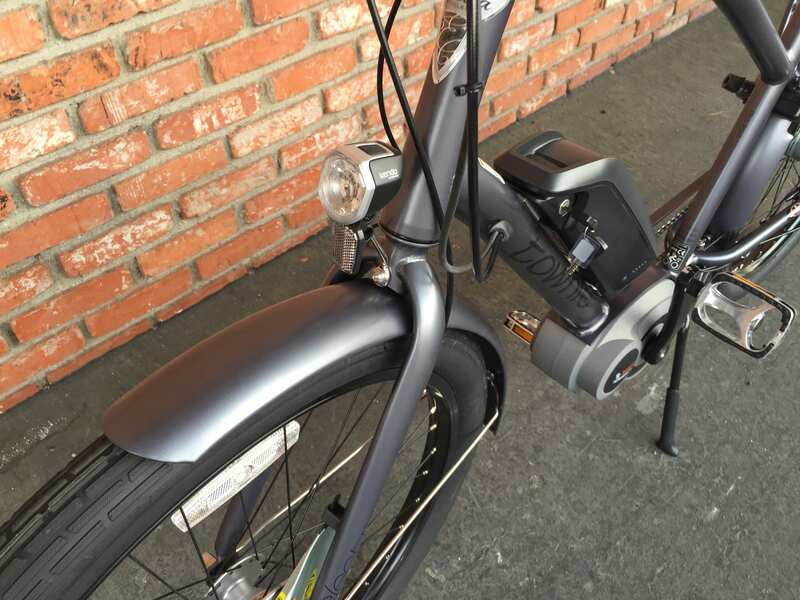 and other ebikes that use the 2014/2015/2016 Bosch Centerdrive system with the PowerPack 400 are all forward compatible to work with the new 500 battery. It fits into the same interface and indeed, would offer more range. The really cool thing is that I believe it only weighs like 1/2 lb more so it’s a sweet upgrade! 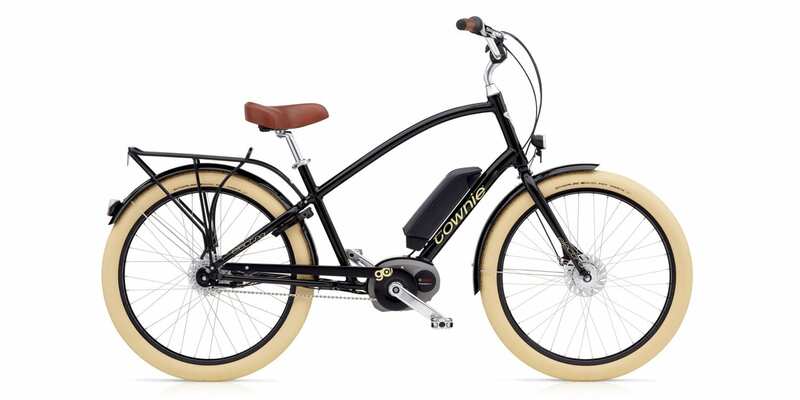 I have a 2016 TOWNIE GO. It is a great bike. I have about 250 miles on mine so far (a few weeks of ownership). It is extremely comfortable courtesy of the riding position, plush saddle and fat frank tires. I have put some collapsible metal baskets and nylon trunk bag on the rack and this expands functionality. I will say the only drawback is the brakes and range. I’m a two hundred pound rider (in northern Nevada) and the band brakes are under powered or whatever the term for weak brakes is….and on a few occasions I have come close to meeting range max. Granted though, that is something an an extra battery on days that I know I will be riding longer on. Many of the city styled bikes to me still have a bent over riding position that beats my shoulder up but not this one. 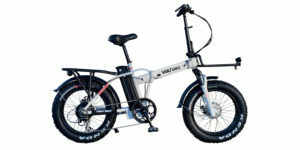 The townie is great platform for an ebike. If you ride alot, go ahead and get an extra battery and then enjoy it till it falls apart. Hi Court, Let me begin by saying you’re the best. Whenever I look at your videos or read your write-ups I know I’m going to get as detailed and smart a review as is possible anywhere. You provide a most needed service and I credit you more than anyone else with making e-bikes more and more popular. I’m an overweight senior and need all the exercise I can get. I bought a Townie 21 speed last June and found it great. It must be the upright position that’s best for me. I rode 650 miles between June and November (Chicago suburbs) and if felt so much better than a Giant Cypress (700c) bought in 2012. I average about 7 miles each outing at 12 mph but feel it’s getting more and more tiring. And what I really want to do is go faster and further. 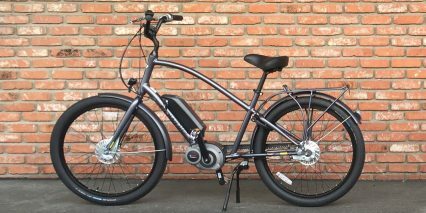 I’m thinking an e-bike is my solution and with my Townie success it seems like a “no brainer” that I should get the Townie Go. And I’m a little bummed that it has roller brakes rather than disc brakes. I even read where roller brakes have grease packed in that provides a little resistance. Am I being too picky? **Are roller brakes fine for just touring paths and mostly level roads? ** This is a big investment for my wife and I who also wants a Townie Go. Just thought I’d check these questions with the best source there is. Thanks much for all you do. I really love the Electra Townie Go! and think it will work for you, despite the less exciting roller brake and possibly downgraded 250 watt Bosch Active Line motor. The model shown here is from 2016 and it says Bosch Performance Line which I believe is 350 watts and a bit more zippy. They also have an Active Line motor that’s 250 with 50 Newton meters of torque vs. 60 and it’s designed to feel smoother… for neighborhood riding. My guess is that for 2017 they’ve switched motors and that’s not a bad thing. You can see the Active Line motor in action on the Tern Vektron here and even hear the company representative talk about why they chose it. If you live near a Trek dealer and can test this bike out, that would be my advice. Court, Love your reviews. 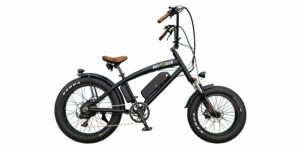 On the townie there seems to be confusion on the websites on the mid drive, I’ve seen 250 watts and also 350 watts listed. I live in Canada where the limit is 500 watts on motors. Could it be they are unloading European models here (250 watts ) and have a more powerful setup in the States? Hi Hank, my understanding is that the hardware on Bosch motors is pretty similar but the software can be tuned for efficiency (Bosch Active), regular city riding (Bosch Performance) or high-torque mountain (Bosch CX) and even though the European models say 250 watts, that is more of a legal thing and the torque is still rated the same. I wouldn’t stress too much about the label… it bothered and confused me a bit when I started to realize there were different labels but I’ve tested a bunch of them and had great experiences all around. 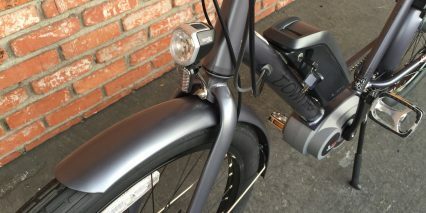 As for the flat foot design, some people really like it… There are lots of cruiser style ebikes with angled seat tubes that simulate flat foot but Electra / Trek has the patent for separating the bottom bracket from the seat tube connection point. The best way to make a decision about body positioning and ride preference is to go for a test ride if you can. I hope this helps! Purchased 2016 Townie and absolutely love it. I have over a thousand miles in 5 months on the bike and enjoy the longer distances without painful knees. I am 68 years old and 220 pounds and this bike has great pick up and enough assistance for fairly steep hills. If I take it to the store where folks pass by they tend to stop and ask about the bike, and some have asked for a test ride and came back with a wow smile. The stopping power of the bike is no problem at all – no worries about the braking system for sure. A great buy for a quality bike! 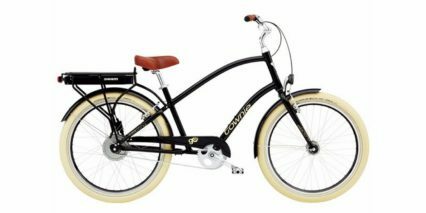 I purchased the Townie Go in April of 2016. I now have over 1100 miles on my bike. I had originally “pre-ordered” the Copenhagen Wheel planning to use it on my Townie — but after waiting 2 1/2 years for it to be shipped, I gave up and ordered the Townie Go. I understand that they are now shipping the Copenhagen Wheel — but if I had waited, I would have missed out on over 1,000 miles of riding! The bike is super comfortable and allows me to ride most anywhere — plus long distances. I’m 64 years old and am constantly telling anyone who listens — “you gotta buy one of these.” I’ve never had an issue with the brakes and the battery seems to hold well for at least 45 miles — sometimes over 50. I bought mine at REI and the service on it has been excellent. My biggest complaint is that there aren’t more people who have e-bikes to ride with! The Cafe lock is also a super plus — anyone who tries to steal my bike is going to have to carry out — and it’s pretty heavy for that! It’s interesting to see how Electra are expanding the Townie Go! line with two new urban-oriented models that address one of your criticisms – tektro hydraulic brakes are now fitted to the Townie Commute Go! and Loft Go! 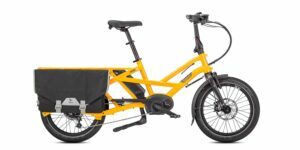 Both new models are equipped with larger more efficient 700C tires, more swept back handlebars, and rear and front cargo racks with the front light relocated to right of the front rack to not obstruct the light when riding with a load. Cool! I haven’t seen those in person yet but appreciate your feedback here Dewey. Will keep an eye out and hopefully, this comment helps people who might have similar questions or concerns. I would like to see a review of the Loft Go! 8i. 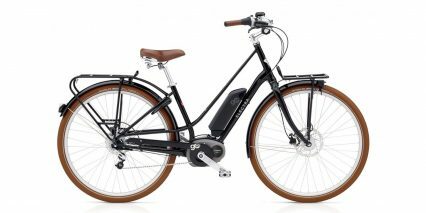 I’ve been shopping for my wife for 3 months and this bike looks like the perfect e-bike for her. 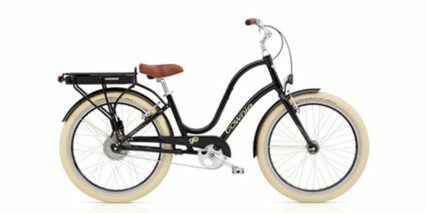 Court, I have just purchased a 2018 Townie Commute Go and it has been updated from the 2016/2017 that you have reviewed here. Tektro hydraulic disc brakes are standard now along with front and rear fender racks. The handle bars are curved back and allows a straight up natural sitting position. The pedals are pushed forward and makes the ride much more comfortable. I have had three hip replacements and a knee scope. I have only a 78 degree hip bend and found most other bikes impossible to peddle. I simply could not get my leg to raise high enough to peddle a bike. This one I can and with very little problems. You need to review this version and let your readers know of the benefits for older riders. Comes with the Bosch 250W drive system and tops out at 20 mph. The walk mode is not enabled on this bike and the kick stand is mounted forward, but those are the only things I find that I wish where changed. This will become your new favorite cruiser. We also have on order a Loft Go for my wife. The frame is lighter and overall the bike is about 5 pounds less than the Commute go coming in around 45 pounds. The Bosch 250w system has been tuned down also on this bike due to the lighter weight of the bike. Wheel base is also about 2.5 inches shorter and the angle of the seat tube is 2 degrees less. It has all the features of the Commute go in a slightly smaller package that fit my wife better. She is 5′ 2″. Keep up the great reviews. They made our decision on which bike to purchase much easier. As someone who is also looking into buying one of the new Electra Go! bikes may I ask you if the Loft Go! you ordered for your wife has already been delivered and put to the test? And if so, if your considerations on the bike being better suited for her, being a bit smaller, compared to the Commute Go! indeed turned out to be true? Since these bikes are very hard to find and test ride (at least here in Europe) your wife’s experiences could be very helpful! Not only to me ( I am looking for a safe, stable cruiser style e-bike for my still very fit, but not too tall 5ft4 mum who’s 72 ) but to a lot of other interested more senior ;-) riders. Thank you in advance Pete! And thank you also for describing the differences you noticed between the Commute and Loft Go! in the first place for that already helped a lot! I was actually searching all over while you already mentioned some of the most relevant differences (the weight, the step thru height) right here! I guess I really am still a rookie here on this forum…. ;-) Hope to hear from you! Court, I wanted to follow-up after my 3-6-17 note to you with Townie Go questions. And to let you know that my wife and I did get new Townies-Gos. We test rode the bike at a nearby dealer and were really happy with the ride. 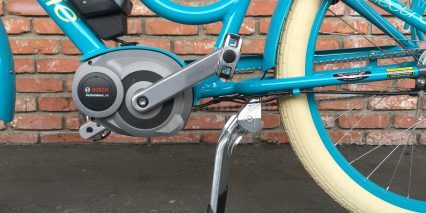 Your reviews already “sold” us on the Bosch mid-drive motor so with great pricing the Townie-Go seemed like a winner. Our biggest problem though was the bright “funky” colors Electra had. We preferred the black (Ebony) color but those white tires… Ugh… they were just not to our liking. So to help make a double sale our bike shop agreed to swap the white tires for the same exact black Schwalbes but with reflective strips (another of your suggestions). The bikes now became perfect for us. I got the last black “D-Frame” available from California on 3-22-17. Unfortunately my wife wasn’t so lucky and her 1 month wait for the black step-through turned into 2.5 months. We were told that the current demand for these bikes in black would be 6 months today. Wow. Here’s what I learned from my first 200 miles on the bike. The rear internal 8-gear hub is just the best. It’s easy and smooth and so quiet. I never hated my derailleur bikes before but this was just a great improvement. And I was even able to easily adjust the gear cable when it became stretched early on (normal I’m told). The instantaneous start and stop of the Bosch motor is fantastic. I can’t imagine what it would be like with any sensor delay. The wider tires (3.35 Fat Frank) add a lot more comfort and stability. No suspension but we do eliminate any front tire movement and hopefully get maximum efficiency. The Intuvia display is great. Easy to use and the left hand extra remote is perfect. Front and rear lights tied into the system (with a switch on the display) make it really complete. Your term “purposeful built” began to mean a lot to us. Other than the cables in the front, the rest seem either all internal or completely hidden. So nice. 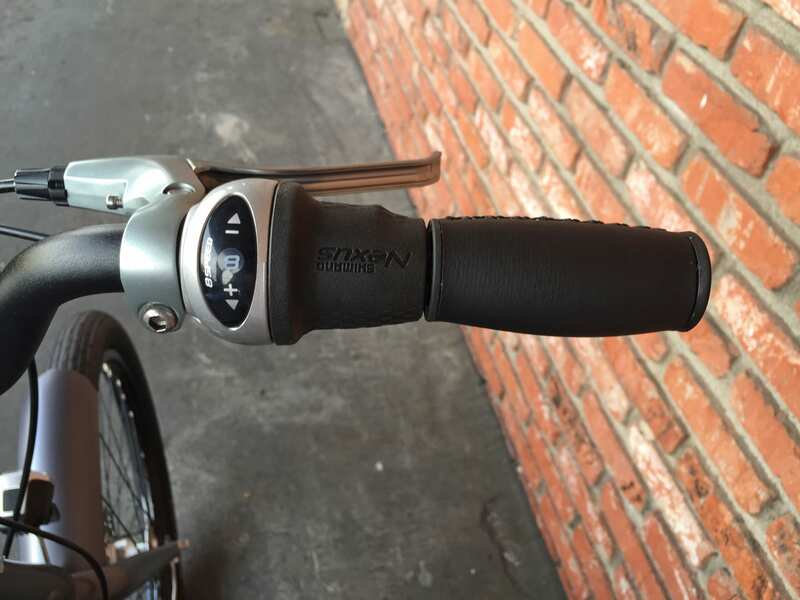 And no need for brake-lever motor cut-offs since the motor cuts out as you stop peddling. Simple and perfect. I never thought this was important but now we agree with you it’s so nice to not have the kickstand interfere with the pedals. And the scissor kickstand adds a lot of stability. Like you say “it would have been nice to at least have one set of bottle cage bosses?” But we have a lot of storage between my rear rack bag and my wife’s added front basket. So we’ll be fine for our long trips. Getting picky, I just didn’t like the hand grips. They maybe stylish but I wanted some rubber gel types. I bought some inexpensive ones and they’re locking too. Nice. The newer 500 battery would have been nice but I am getting 50-55 miles of range on our 400 and with me being a heavy guy that seems great. What I left out are the roller brakes. I just couldn’t decide if it was Pro or Con. We’ve never had any type of disk brakes to compare it with so maybe we’re not the best judge. But we found these brakes work just fine for us in our mostly flat midwest terrain (50 miles NW of Chicago). No major hills or big descents like other areas of the country. 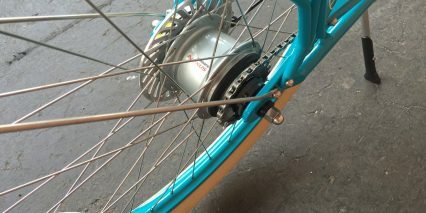 And these brakes seem to give us no noise and make the bike look simpler and cleaner. 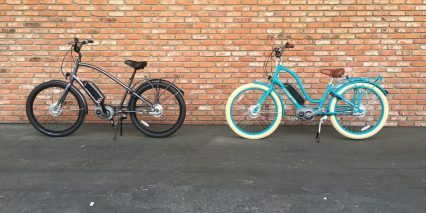 Overall we’re very satisfied with our Townie e-bikes. We feel lucky to have the high quality Bosch Performance Line (with 63 NM of torque) which gets more than enough power. Any more power would just be over-kill for our riding. And lastly, your reviews taught us so much about e-bikes. We feel we owe you a lot for all your help. Wonderful writeup Jeff, thanks for taking the time to prepare this and reflect on the experience. I’m sure others here will find it useful! The Townie Go! is one of my favorite recreational electric bicycles and it sounds like they are selling pretty well. Maybe Electra / Trek reps will see your points about colors and grips for future iterations. In the mean time, it’s great that you found some upgrades that work well for you. Enjoy the ride! My emotional favorite is the E-lux Tahoe, it’s a beautiful bike. The Radrover seems like great fun at a great price and is my wallets favorite, I just added the E3 Dash as it would be fast and fun, I haven’t researched it yet but there is likely a Raleigh branded version of the E3 dash that may have some slightly different colors or other options. Anyway, based on my short list, what do you think, which would you choose and why? Hi Steven, I’d consider the Magnum Metro for its power, low price, tire style, and accessories… even though it doesn’t have a mid-motor. I love E-Lux and their Tahoe model is indeed a wonderful powerful bike (more powerful feeling than the Metro in my experience). 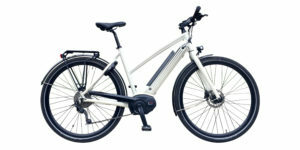 For mid-drive powered ebikes, the best value right now seems to be the Bulls Cross E which uses Bosch. For under $3k you get an amazing bike but it doesn’t have the fatter tires or internal gearing (none of these do). You might need to explore Riese & Müller for NuVinci systems and they cost a lot more… and weigh a bit more as well. I hope this helps! Another consideration at the most affordable end could be the Surface 604 Rook. I’ll be reviewing the Electra Comute Go! 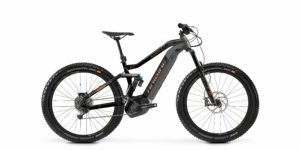 very soon as well, it’s a great e-bike. In my search for a relaxed bike I have come to the Townie and unable to find anything that resembles it, so far so good. Thing is that i am close to 6’2″ and, well, that may be too tall for this bike, I am not all about looks but I do not want to look like I am on a kids bike and is it even comfortable at that size? Hi Jack, have you tried the Townie Commute Go? 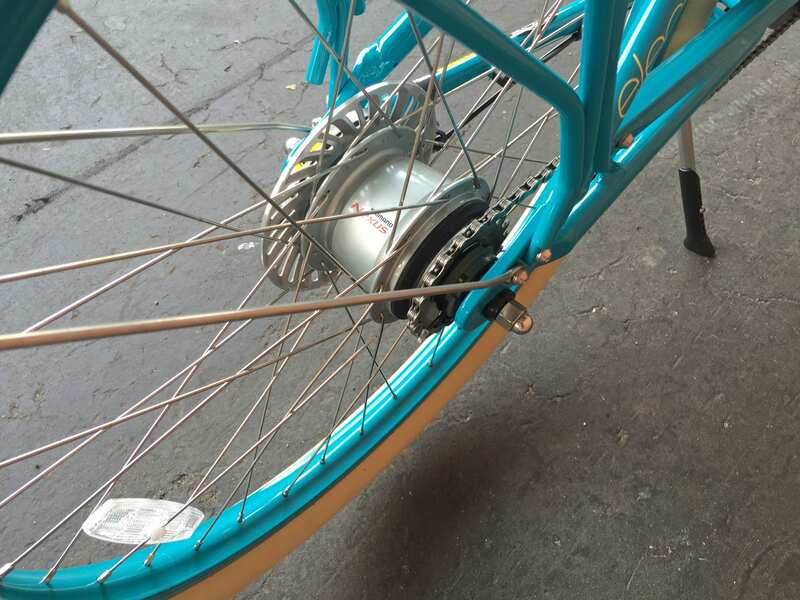 It uses a larger 28″ wheelset which elevates the bike and might fit your taller body better. I think with a bit of handlebar adjustment, either bike could work, there isn’t a huge difference between most frame sizes (just an inch or two in length of top tube). Here’s a review I did of the Townie Commute for you to check out. Thanks for the quick reply, Electras are getting harder and harder to get here, maybe i should stick to something that is made here, its not like bikes are not getting made in the Netherlands. I liked the Gazelle you reviewed, maybe a Batavus or a Giant. DO NOT BUY. I could not be more angry at a company if they put a representative on a plane, he flew to my house, knocked on my door at 3 am and spit in my face. I paid nearly $3000 for a Townie GO only two years ago. My battery is dead and there is no source for another. NONE. The company that made the proprietary design no longer makes them (I called Chicago), they have no backstock, and Electra didn’t bother to stockpile any for their customers in the future — the ones who, I must again state, shelled out 2-3 k for their product. The same for the charger, were that to be stolen, or fail. There are none to be had, none in production, none set aside for consumers in the future. I don’t think this bodes well for anything this company puts forth and I will never do business with them again. Should I ever be able to afford to. Hi SM, I’m so sorry to hear that your bike stopped and that you have not been able to get a replacement battery. Does the version of the Townie Go! 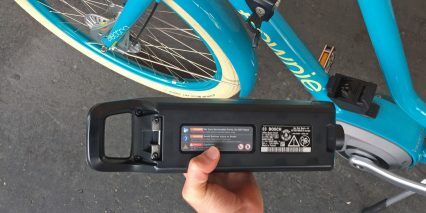 that you own have a rear rack battery like this and use the SRAM hub motor? If yours is newer and uses the Bosch mid-drive and Bosch Powerpack 400 I may be able to help you find a replacement… but unfortunately, I have not seen the older SRAM designs around. I could still reach out to some shops or perhaps you could post a wanted ad in the EBR forums wanted section here. I’m sorry you had such a bad experience with your e-bike. I don’t know if you have found a replacement battery yet. There is a company nearby me in Newark Ohio that rebuilds e-bike and power tool batteries for about half the cost of new. They’re called Nethers Batteries. Here is the web address https://netherswholesale.com They do a great job. Anyone need they’re e-bike battery refurbished give them a call. They handle all brands. 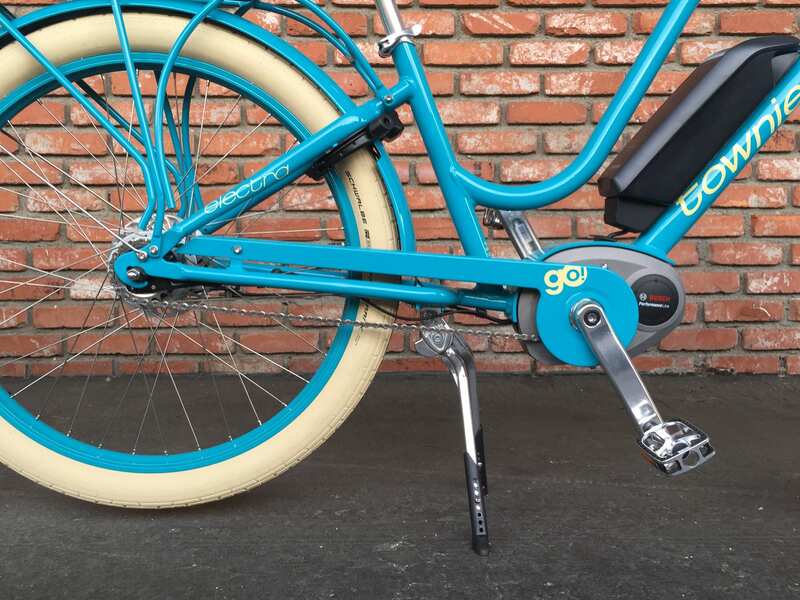 I just bought an electra townie go… I love the smooth power and easy acceleration and deceleration with the assist! I can go anywhere without worrying about the hills… I am struggling to know how to transport my bike. I have a bike carrier that has two arms with feet to sit on the back bumper and one arm for on the trunk with 6 straps… purchased several years ago from a bike store. I have a Toyota Camry. The other choice is an older pickup which will get less gas mileage and I don’t know how I would lift it into the truck bed. I looked at adaptor bars… and would have to use the truck if I use a hitch rack which looked expensive… The other question is will a water bottle fit in the cup holder? Another question… on my Trek bike I carried a CO2 cartridge for flats, tube etc. What should I carry for this bike?? I hope the wheels don’t go flat as easy as some people have reported because I take country roads.I couldn’t find a mirror for the electra on the main site either. Hi Penny! 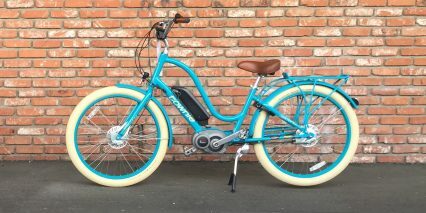 I’m so glad to hear that you are enjoying your Electra Townie Go! 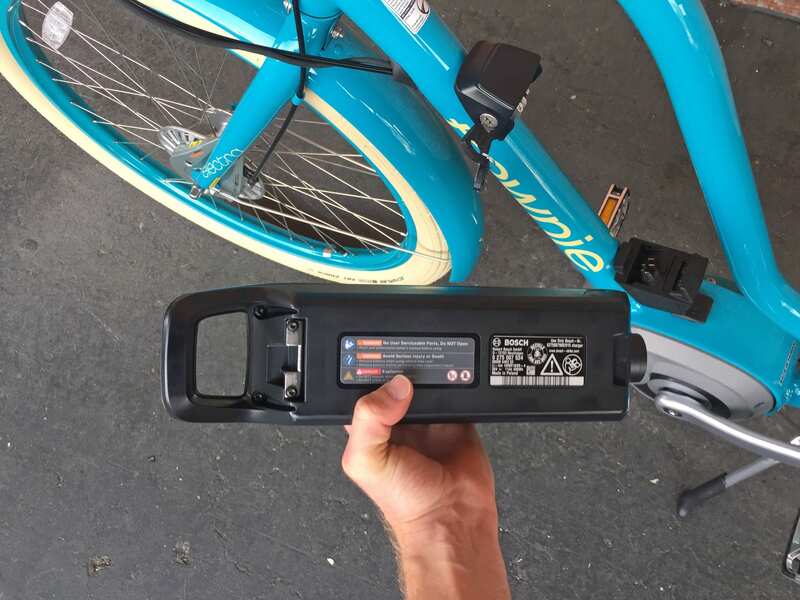 Finding a bike rack that can fit some of these electric models can be difficult because they are heavy and indeed, may require a crossbar adapter like this if you have a hanging style rack. I suggest removing the battery pack when transporting to reduce the overall weight. I personally opted for a hitch rack and installed a 1.25″ hitch on my Toyota Prius so I could use it… and yes, it did cost a lot of money. There are some cheap ones that can work, like this, but they don’t have locks or offer as much stability. I purchased and tested one of these racks a while back and it did work okay, but not as well as something like this, which even has a ramp so you don’t have to lift the bike! As for pumps, I always carry one like this which has a pressure gauge built in and can work with Presta or Schrader type valves. I am not a big fan of the CO2 air cartridges because they expire more quickly when using and just seem wasteful. The hand pump will last a long time. I Hope some of these tips help you! 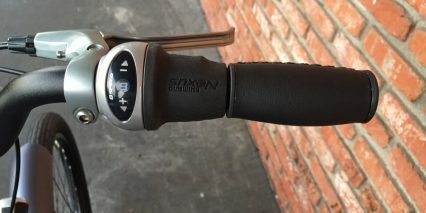 Also, here’s a short article I wrote about other accessories that can be good to use if you are new to ebikes or bicycling in general, it might give you some ideas or stimulate alternatives to what I wrote above. 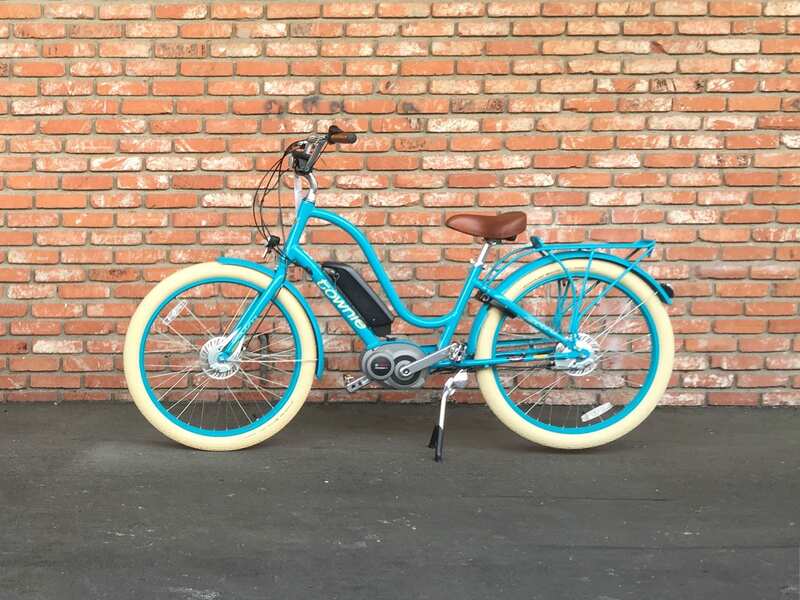 I bought a 2017 Electra Townie Go! and I’m very happy with it. I’ve started to use it for a commuter bike and love the upright position that you are in while riding it. I really like that the internal hub for the gears keeps everything neat and clean. The jury is still out on the brakes, I’m not sure about them yet. The Fat Franks give a nice ride and I’m a big guy! The mid-drive motor is outstanding. My wife says that whenever I’m on the bike I’ve got a grin from ear to ear. This bike was purchased through a local bike shop, Big Sky Cycling. I have purchased several bikes from them in the past and went to them when I started to look at e-bikes. I found it important to see, touch and ride the bike before I bought it. I want to thank Court for the reviews that you do and the information that you post. It helped me through the decision process and understand what I wanted in a bike. Court, when will you revisit the Townie Go i8 2018 models? Bought a 2018 Townie Go i8 from Bently Cycle Alberta, Canada, very happy with the bike. Have put on about 100k so far and must say that the review that was given on this web site portrays the bike in a fair and accurate manner. I don’t find the brakes to be an issue, however I was wanting to purchase a bike with disc brakes, but for the price the drum brakes are a good way to keep the cost in line. First, thank you so much for all of the reviews! They have helped me so much to narrow down my search for an ebike. I’m torn between the Electra Townie Go step through (cause I think I love the Bosch motor) and the Magnum Cruiser (cause I love the throttle). I’ve also used your awesome “compare” page, but I get so confused when trying to compare so many things. I would love it if you could provide me with some insight as to which you would recommend. Price point between these two bikes is close enough that I’m not considering that at this point. Thank you! Thank you so, so much! I really appreciate your insights! I might be on my way to purchase an ebike soon! Hi, we watched your youtube video and read your review, thank you, both really excellent! I am now just about to buy an electra townie go 1 year old second hand. The lady who is selling it says it was “German assembled”? Is this something to do with Trek? She also says only a 1 year warranty, am guessing this is from the bike shop she purchased it from, and that the Electra warranty is separate? 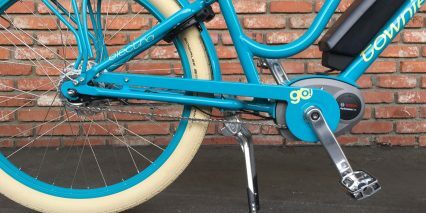 So I just got my Townie go! 8I and I wonder, has anyone else seen the walk assist turned on? Yes, I’m saying my bike DOES have walk assist. The bike needs to be in eco mode ore higher but pressed the button then pressed the “+” on the control pad per the display screen et viola! Same roller brakes, Bosch performance line and awesome army gray color scheme (I love Electra bikes and no not my first Electra). I haven’t had the chance yet to ride the bike far but living in Reno and commuting to work 16 miles each way and up a 1500 ft climb should be easy on this beast. Love the bike thus far! So other readers know, this isn’t my first electric bike, I own an Izip E3 Dash 2015, so rear hub motor version. That bike was fun but it was a bit of work going up hill and the range estimates were a bit off. Being 6’4″ the bike required some shall we say creative thinking to fit e.g. taller seat post and longer stem. Electra’s don’t have that problem. The bike works out of the box because of that “flat foot technology” even with my 36 in inseam and I’m not maxed out. This is why this one size fits most bike I had no trouble leaping at. Oh and the 2018’s have a bit of a deal on them so I paid far less than list $2299 for the bike. As before Court EBR helped point me in this direction. I went to a LBS and they had Brose and Bosch so they worked with me on both systems. They are both VERY solid companies and I heard GREAT stories from the shop owner of both jumping through fire to help customers.